1 Get your skillet nice and hot over medium heat. Melt butter, throw in the garlic and just sauté until light golden. 2 Throw in the shrimp and continue sauteing until it turns light pink. This will take about 3-4 minutes. Set aside. 3 Let’s now make our dressing made by just dissolving Knorr Sinigang sa Sampalok Mix in boiling water. Then, let it cool to room temperature. Once cooled, slowly whisk in olive oil and the dried oregano. Give this a good seasoning of salt and pepper. 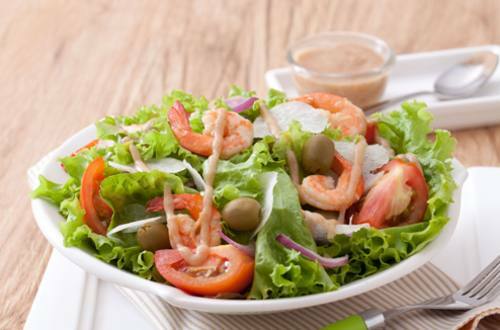 4 Let’s plate the dish by serving it in a bowl combined with the mixed greens, tomatoes onions, labanos, olives and the sautéed shrimp on top. Now comes the icing on the cake! Drizzle the dressing over, toss to coat and that’s our dish! Totally yummy and oh so healthy! Serve this any time of the day or week.